In order to exploit the emerging opportunities in the marketplace or in society, service organizations are increasingly interested in new innovation models and effective innovative practices. The involvement of users and stakeholders is an essential aspect in these models. This is also the basis of the service-dominant (S-D) logic. This framework replaces the traditional producer-centric view with an actor-to-actor perspective and considers the integration of resources an essential activity in the co-creation of value. Even though S-D logic has apparent implications for theorizing about service innovation, managerially-oriented research in this area is at an early stage. Product- and producer-centric practices and in-house R&D are still the focus of innovation studies, and they also dominate innovation efforts in organizations. 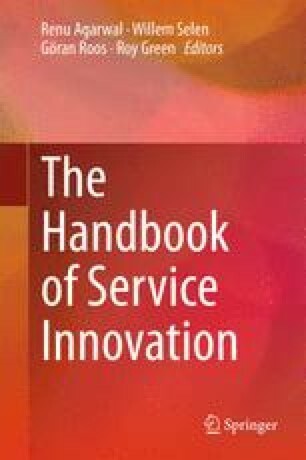 The particular interest of this chapter concerns the integration of user-based and employee-driven perspectives in innovation. The two perspectives have until now developed separately, the latter having very few linkages to the S-D logic discussion. However, grassroots-level employees are in a key position as receivers of user insights and as collaborators with users. We suggest a new integrated approach by analyzing the user–employee interaction in innovation both theoretically and in two empirical cases.